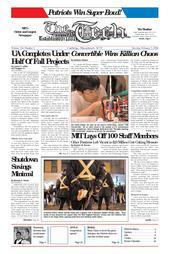 MIT will lay off approximately100 staff from its administrative branch this year and leave another 130 positions unfilled, said Executive Vice President John R. Curry. About 60 layoffs have already been announced in the Information Services and Technology Department, said Jerrold M. Grochow, vice president for IS&T. The department will also leave ten positions unfilled. The other layoffs will come from the facilities department, although their exact size and nature has not yet been fixed. Sirianni declined to comment further pending the official announcement of the layoffs this Thursday and Friday. Curry said that layoffs and empty positions would save the institute approximately two-thirds of the $35 million dollar gap in next year’s budget. Curry said that for almost all empty positions, they are “basically telling people we have a hiring freeze,” and are losing staff through attrition. The hiring freeze carries over to administrative staff for faculty as well, said Provost Robert A. Brown, although some positions may be filled occasionally. Brown said that one of the reasons there were no layoffs in the faculty side of the administration was because the faculty side was able to save money by cutting the subsidy for graduate tuition by 15 percent, for example. “Because of the size of the cuts, we’re going through a pretty significant reorganization,” Grochow said. “We’ve clearly attempted in this period to bite a big bullet and do it once,” Curry said. He said that the department was currently working to reassign the responsibilities of the vacant positions to the remaining staff. “Our first priority in everything that we’re doing here is to make sure that the campus networks are operating and that they are secure,” he said. There are about twenty other information services groups on campus within various departments, such as the Computer Science and Artificial Intelligence Laboratory. Only the central IS&T department will lay off staff, however. “Some of the reductions [in staff] should be permanent,” Curry said. He said that the administration was working to let MIT grow without an increase in support costs, in part by pushing for a greater use of information technology. “We reduce huge amounts of paper flow” using the new technologies, he said. However, he said that some of the jobs of the people who are being fired cannot be greatly optimized, such as in janitorial or gardening staff. “We will have fewer facilities staff for more square feet” after the layoffs, he said, in part due to the opening of the Stata Center. He said MIT will “rebuild from a demand basis,” and “we want to be ready to hear about” gaps in services that need to be filled.